AlltanksCom LLC offers quality loaf tanks for sale. 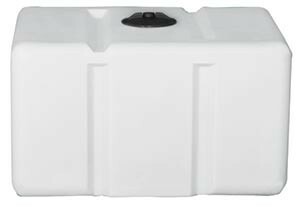 Loaf tanks are rectangular storage tanks. They are rotational molded, one piece, seamless of FDA-NSF-61 approved polyethylene resins. Loaf tanks get their name because they are proportionally similar to a loaf of bread. Its shape allows insertion into trailers, skid systems, truck beds, and plant system process. Our polyethylene ensures long-term usage in whichever process it is inserted. Black is available for potable outdoor installations. Mobile applications require a set of bands to stabilize the loaf tank in your installation. These are typically custom to your application. Note: If used in chemical processes, make sure the connections and gaskets materials will endure all chemicals involved.